The French have an enormous passion for their food, for cooking it, shopping for it and eating it. We would all like to pick up a little of that passion, and Trish will show how to. This book will explore the fabulous edible heritage of France’s countryside, where every village seems to have its speciality. Chapter titles such as ‘Fast’, ‘Posh (but not too posh)’ and ‘Slow’, will give you French country recipes for all occasions. With recipes like navarin, a simple delicate lamb stew perfect for a springtime lunch, to pan bagnat, the famous fishermen’s salade Nicoise sandwich, this guide from one of France’s top cookbook authors will bring the sheer beauty of France right to your kitchen table. 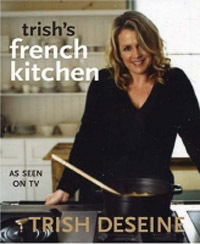 With stunning photography and charming personal insights into the methods and history behind each dish, Trish’s French Kitchen captures the air, sun and soil of the countryside and brings all the flavours of French cooking into your own kitchen....It’s chapters offer recipes for every occasion, whether you want to spend hours in the kitchen or whip up a delicious supper in no time at all.